Hot Summer Economic Weirdness - Thoughts From The Frontline - Investment Strategies, Analysis & Intelligence for Seasoned Investors. Home for the Summer and Hopefully Cleveland? We who inhabit the northern hemisphere will soon enter summer. Many would say summer is already with us – most schools are closed, and a general laziness is beginning to set in – especially for those in the “protected” class. For many of them, summer is a verb. They “summer” in the Hamptons, or Lake Tahoe, or somewhere in the tropics. Summer isn’t lazy for the “unprotected.” Working parents often dread it because they have to find – and worse, pay for – child care for their out-of-school children. Vacations to the tropics or anywhere else are just a dream. We may be in for a very hot summer. Where to begin? This week the European Central Bank launched a new stimulus tactic: outright purchases of corporate bonds. This buy will be in addition to the 800+ billion euros of government bonds it has bought since March 2015. The ECB wants to create inflation by making borrowers an offer they can’t refuse. European public companies have been issuing new debt at a record pace this year. I can see why, too: interest rates were at record lows. The ECB intends to drive them even lower and possibly negative. If you are the board of a Eurozone company and your central bank offers you free or better-than-free cash, of course you take it. Japan already proved that this can work back in January, when it first bought corporate bonds at a below-zero interest rate. And this new tactic of the ECB is going to affect more than just corporate bonds in Europe. US multinationals with European subsidiaries (and most have them) are going to be lining up to take advantage of a central bank that will buy up to 70% of anything the corporations issue, at rates that can’t be matched in the US. At least for now. You think that’s not going to bring European-style central banking to the United States? If you’re a corporation in Europe, the harder question is what to do with your free cash. The ECB wants you to buy stuff and drive up prices. That would leave you owning stuff, which isn’t rational if you think deflation will continue. So the ECB has a chicken-egg problem. They can’t have inflation unless businesses and individuals spend their cash, but everyone will hoard their cash until they’re convinced inflation is back. Liquidity is another problem. Bloomberg calculates that the universe of corporate debt eligible for ECB purchase totals about €620 billion. To produce the desired effect, the ECB will have to own a significant chunk of that market. At some point it then stops being a “market” by any normal definition. Japan is already dealing with that problem and worse, since it buys equity ETFs as well as bonds. The Japanese government bond (JGB) market is becoming a monopsony – the opposite of a monopoly. Instead of one seller, JGBs have only one buyer. It is very possible that other markets will soon operate similarly. How can the center hold in such an economy? Where does the distortion of markets end? I don’t know. More to the point, Draghi and Kuroda don’t know, either. Draghi is buying private assets because in his view there are no better options. Even at the “relatively” small amounts it is buying now, the ECB is already distorting the credit markets. The ECB won’t officially confirm what it bought until sometime next month, but word quickly leaked out that the purchases included Anheuser-Busch, InBev, Siemens, and other well-known names. Do you think some bond traders might have used that information before it appeared in the press? You know the answer to that one. Regardless, Draghi will keep buying assets. He could buy most of the Eurozone and still not have any inflation. Speaking of cash-hoarding behavior – which is one side effect of negative rates – one of Germany’s largest banks is seriously considering it. Sources within Commerzbank have told Reuters they are “examining the possibility” of hoarding physical euros by the billions in secure vaults. This would let them avoid the -0.4% NIRP penalty for parking cash with the ECB. This is truly bizarre. Under normal conditions, holding cash is anathema to commercial bankers. They keep as little as possible on hand and certainly don’t go out of their way to hold more. Yet here we see a major bank considering doing just that. The only way that tactic makes sense is if the bank can’t profitably lend the cash to its customers, which, given the rules for lending in Europe, actually happens to be the case. Nonbank financial institutions are also storing cash. Munich Re said back in March it would store both physical cash and gold to avoid paying negative interest rates. Management framed the move as a minor test at the time. It may well have been – but you don’t conduct such a test unless you see some chance that you will need to hold cash on a larger scale. Perhaps not coincidentally, the ECB thrilled conspiracy buffs last month by announcing it would cease issuing 500-euro notes after 2018. The ostensible reason is that the large notes could “facilitate illicit activities.” Few believed the deterrence of crime was the bank’s main objective. The presence of large amounts of physical cash in an economy is inconvenient for any central bank that wants to push interest rates negative, as the ECB does. Now the ECB’s move makes more sense. Draghi isn’t worried about German and French citizens stuffing their mattresses with euros. The real threat would be banks doing so on a much larger scale. Here’s my guess. The ECB’s promise to continue issuing 500-euro notes until 2018 is probably honest – but they made no promises about how many they will issue. I bet the number slows to a trickle very soon. The big bills will be hard to find, especially if your name is Commerzbank or Munich Re. Already it is clear that lower and lower interest rates and ever larger purchases are confronting the law of decreasing returns. What is more, the ECB has lost credibility within markets and more worryingly among the public. But the ECB’s response is to push policy to further extremes. This causes misallocations in the real economy that become increasingly hard to reverse without even greater pain. Savers lose, while stock and apartment owners rejoice. Worse, by appointing itself the eurozone’s “whatever it takes” saviour of last resort, the ECB has allowed politicians to sit on their hands with regard to growth-enhancing reforms and necessary fiscal consolidation. Our models suggest that in its fight against the spectres of deflation and unanchored inflation expectations, the ECB’s monetary policy has already become too loose. Hence, we believe the ECB should start to prepare a reversal of its policy stance. The expected increase in headline inflation to above one per cent in the first quarter of 2017 should provide the opportunity for signaling a change. The chances of ECB’s reversing policy as Herr Folkerts-Landau suggests range between slim and none. He surely knows this, too, which makes me wonder what he hopes to accomplish with his pronouncement. DB senior management must have approved the message. Given their situation, it is a strange way to talk about your regulator. Maybe we’ll find out what DB is up to before this weird summer is over. As a sidebar, I thought I would throw in the following rate chart from Europe and Japan, showing just how far out the yield curve negative rates extend. Given that the ECB intends to absorb investment-grade corporate bonds, it is going to push corporate bonds into negative rates when they’re sold on the open market and will push the negative rates out on the yield curve for sovereign bonds. How in the Wide Wide World of Sports does anybody think that pensions and insurance companies can survive in such a market? Remember, they are required to hold a certain amount of government bonds, and their investment return targets are north of 5%. I could do a whole letter on the coming debacle in European insurance companies. It is way beyond the crisis point now. Across the Channel, UK citizens will vote on June 23 whether to leave the European Union. The latest polls suggest that the vote is very close and the “Leave” side has a slight edge. However, the poll I saw this afternoon showed “Leave” ahead by a full 10 points, 55 to 45. More importantly, the trend over the past few weeks has seen the spread in favor of “Leave” widen. If you are in the “Remain” camp, you have to be worried. It is hard to overstate the impact Brexit will have, should it pass. And the impact will spread far beyond Britain’s borders The UK is the EU’s second largest economy after Germany and one of its largest exporters. Numerous laws and international agreements may need to be rebuilt. Even with years of planning, Brexit could make the Y2K bug look puny. A major concern is what a winning Brexit vote might inspire in other nations. French voters dislike the EU even more than UK voters do, according to a recent Pew survey reported by Ambrose Evans-Pritchard. The EU racked up a 61% unfavorable rating in France versus 48% in the UK. 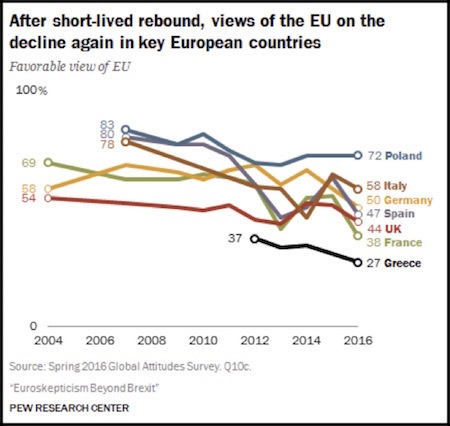 Opinions in Spain and Germany aren’t much more positive. The EU doesn’t look like an “ever-closer union” to the citizens of its largest members. NINE out of 10 Dutch people hope the Netherlands will hold its own EU referendum amid mass discontent at Brussels bureaucrats. A whopping 88 per cent of people polled by a top Dutch newspaper said they would be in favour of an in/out vote along British lines. They have been inspired by possibility of Britain quitting the bloc on June 23 – and hope ‘Nexit’ will follow Brexit. Despite this trend, Politico reported last week that French leaders intend to push for severe consequences against the UK if Brexit passes. Paris thinks it must send a strong warning to other would-be deserters that leaving the EU would be very painful. Maybe they also want to send that warning to their own citizens. The EU is a distinct entity from the Eurozone currency area, which has its own problems. I think the EU can probably survive a Brexit, but it won’t survive a Frexit, Germexit or Spexit. (Just for the record, there is no easy way to combine Italy and exit, so I think that will have to be referred to by the Italian word for exit – Uscita – if and when the time comes.) And that would leave Europe back where it was before World War II: a fragmented continent in which disagreements get very ugly and occasionally turn violent. No one wants that outcome, but very few Europeans outside EU headquarters in Brussels seem happy with the status quo, either. This summer could see the beginnings of a devolution. It’s up to UK voters now. The mood in Europe is part and parcel of the same phenomenon that we are seeing with Trump and Sanders in the United States. There is growing discontent with the establishment, no matter which party people are aligned with. Thus the pollsters are going crazy trying to figure out how to handicap this referendum vote in England. The numbers are not breaking down along the normal left–right lines that they have in their political models. 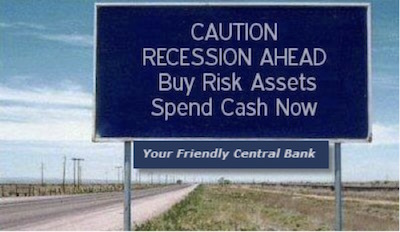 After hearing so many speakers talk about the potential for another recession at my Strategic Investment Conference last month, I started collecting recession warnings. Now I see them everywhere. Worse, many come from people I greatly respect and have found reliable over the years. In the next week I flew to New York where my usual wont is to call dinner with a small group of friends, at which we talk all things economic, political, and social. One of the fixtures seems to be Art Cashin, but busy schedules insure a fresh rotation. This week, in addition to Art I got to have dinner with great friends Jack Rivkin, a longtime PaineWebber partner and now the brains at Altegris; Peter Boockvar of the Lindsey Group; Rich Yamarone, chief economist at Bloomberg; Lakshman Achuthan, the guiding light at ECRI; and Vikram Mansharamani, a Yale professor and author of Boombustology. One of the questions I posed was, “When do you expect to see the next recession?” And the calls were all over the board. There is hardly a better group to ask about the timing of a recession. One person thought the recession will start in the fourth quarter of this year; another suggested that it will start in January of next year; several others thought 12 to 18 months; and the outlier anticipated that recession is still two to three years off. As I reflected on the responses later that night, I realized I could create my own dot chart, similar to what the Fed does with its interest-rate and economic forecasts. Now seven people is a group, but it doesn’t give us the “wisdom of the crowd.” So I spent Thursday and Friday making phone calls. I got ahold of David Rosenberg, Martin Barnes (of the Bank Credit Analyst), Lacy Hunt, and Jim Bianco, among others. I didn’t need to call Albert Edwards of Societe Generale, as (a) he is always bearish, and (b) he just came out with a newsletter saying that a recession is imminent, which in his terminology and reading of the data means fourth quarter. You can read his take here. 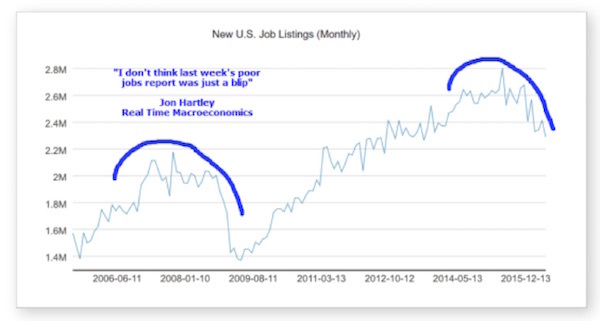 And then Mish Shedlock shared this chart that supports his own recession call. If the jobs trend follows what we saw in the last recession, it is about to get much worse. Not all of the forecasts from the group I polled by phone were as bearish. A couple didn’t think a recession would start for another five years absent an “exogenous” shock (i.e., one originating outside this country). But that caveat was also invoked by nearly all of those who didn’t think the recession would start later this year: in their next breath they explained that their forecast would be brought quickly forward if there is an external shock from, say, Europe or China; and some mentioned policy mistakes from central banks as a potential shock. Why do I keep repeating that phrase? Precisely because Brexit, as explained above, could deliver an enormous exogenous shock. And it is something that could happen on June 23 – 12 days from now – triggering repercussions throughout Europe and then the rest of the world. Can anyone in their right mind imagine Janet Yellen looking at Mish’s chart above and deciding to raise interest rates anyway? And then realizing that the polling ahead of Britain’s vote on leaving the EU now suggests that Brexit’s going to happen? I sure can’t. The Fed surely won’t pull the trigger at next week’s meeting; and if we see Brexit, then a rate increase won’t come at the late-July meeting either. We will still be digesting the consequences of Brexit. Then we get past Labor Day and into the heat of a particularly hot and nasty election. Will the Fed throw fuel on that fire? Maybe we’ll see a rate hike in one of the winter meetings IF the data turns around. Fact is, we have just lived through the most significant policy error committed by a central bank in our lifetimes. The Fed did not raise rates in the latter part of 2013 and throughout 2014 when they had the opportunity, and now that moment may have slipped past them. We could plunge into the next grizzly recession while the Fed still has no ammo to load in their monetary policy gun other than the rubber bullets of further quantitative easing and, gods forbid, negative rates in the world’s reserve currency. All the data show that quantitative easing is not all that effective for doing anything other than raising asset prices for the rich. I want to reiterate a point that I’ve made in past letters. The Federal Reserve is not authorized to do anything but buy government debt. They are not authorized to do a “helicopter drop” or buy equities or even corporate paper. Those moves would require a change in the Federal Reserve Act, and that means action by Congress in an environment where elements of both parties would like to change the Federal Reserve Act significantly in ways that the Fed would not find particularly helpful. Not that anybody agrees on much of anything. If I had gone to people four years ago and said that 40 percent of the world's sovereign bonds would be at negative rates, that central banks would expand their balance sheets by $10 trillion, and that the world would still look somewhat normal, even with all of the geopolitical risks that we have with ISIS, etc., people would have said, “John, what are you thinking?” And yet all of those unthinkable things have come about. In a future letter I will summarize that speech. Even contemplating what should truly be unthinkable is enough to give us economic heartburn. Perhaps we’ve sailed past the era of conventional monetary policy, off the edge of the known world. My doctor and friend Michael Roizen (author of a number of bestselling books, with 28 million copies now sold), head of wellness at the Cleveland Clinic and one of their directors, is a huge Cleveland Cavaliers fan, having box seats right on the floor. He invited me to come up to watch a game, and I decided I would wait for a game six. After last night’s game, won decisively by the Warriors (they are now 3-1), it looks like I may have made a bad decision. Now I can only hope that Cleveland somehow pulls it together on San Francisco’s home court to force a game six. I have not booked my tickets to Cleveland just yet. Other than that, my general intent is to stay home for the summer, writing my book and letting my body recover from all the traveling I have done over the past 10 years. The thought of a summer at home is very pleasant, although I know I will have to do some quick shots here and there. Just comes with the territory. Researching what the world will look like in 20 years has led to some remarkable surprises. Las Vegas may soon be employing a remarkable flying taxi, designed in China, which will fit one person. When you start looking into such ventures, you find that Larry Page of Google has funded his own flying car project, and there are actually half a dozen other serious – and by serious I mean there is major money backing them – companies all looking to bring us various novel forms of flying transport. Quite a few people grew up watching the Jetsons and wondering when we were going to get our flying cars. Now, some of them have decided to go ahead and build one themselves. I don’t think I will be looking to put my money into these ventures, but I’m glad other people have that kind of risk capital and are willing to spend it on cutting-edge technologies. Actually, though, flying cars are not as far-fetched now as they once seemed. Electric motors and batteries have removed the obstacle of heavy combustion engines. Many of the designs look just like much larger versions of the drones you see flying over your backyard. Uber? Lyft? Automated cars? And now automated flying cars? If I drove a taxi for a living, I might feel just a little paranoid. You have a great week. I’m looking forward to getting more acquainted with my neighbors, catching up with friends here in the area, and for sure doing my workouts more regularly. It’s looking as if it’s going to be a good summer.